US PRESIDENT Donald Trump’s warning of “fire and “fury” to North Korea was completely unscripted, according to officials. The message President Trump delivered on Tuesday afternoon “was unexpected, but it wasn’t surprising,” The Post reported one of the officials as saying. While some lawmakers and experts feared the statement was dangerously inflammatory, Secretary of State Rex Tillerson and Defense Secretary Jim Mattis defended the President’s forceful warning. “What the President is doing is sending a strong message to North Korea in language that Kim Jong Un would understand, because he doesn’t seem to understand diplomatic language,” Mr Tillerson told reporters. Meanwhile, North Korea has slammed President Trump’s bellicose words, saying it will develop a plan to strike the US island territory of Guam in the coming week. 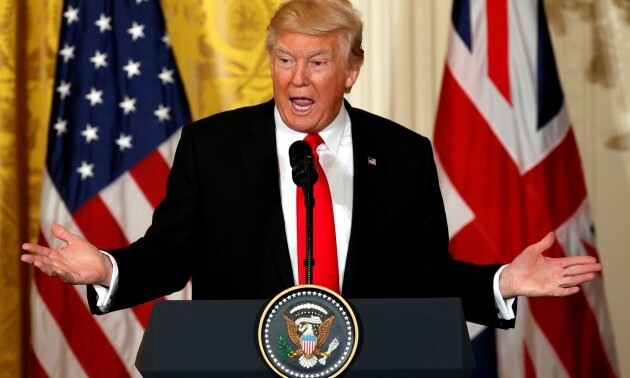 In a statement, North Korean media slammed the US President as “bereft of reason” and would only respond to force, state media reported, in an escalation in Washington’s war of words with Pyongyang over the regime’s nuclear drive. Trump this week stunned the world with a bold-faced message to Kim Jong-Un, saying his country faced “fire and fury like the world has never seen”. Pyongyang later said it was considering a missile strike near the US Pacific territory of Guam. 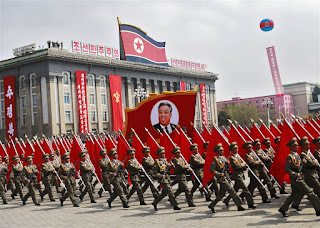 “Sound dialogue is not possible with such a guy bereft of reason and only absolute force can work on him,” the official KCNA news service quoted General Kim Rak Gyom of the Korean People’s Army as saying on Thursday morning. 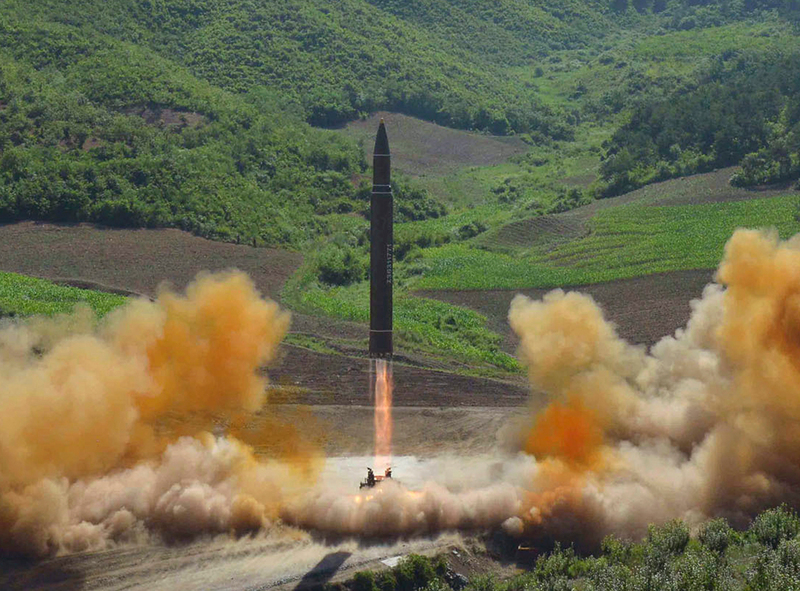 North Korea will develop a plan by mid-August to launch four intermediate-range missiles at the US territory of Guam before presenting it to Kim Jong Un, who will make a decision on whether to proceed, the North’s state media says. “The Hwasong-12 rockets to be launched by the KPA (Korean People’s Army) will cross the sky above Shimane, Hiroshima and Koichi prefectures of Japan,” the report said on Thursday, citing General Kim Rak Gyom, commander of the Strategic Force of the KPA. The tweet came as Mr Trump traded escalating threats with North Korea. Mr Trump on Tuesday threatened “fire and fury” if North Korea made more threats to the US And North Korea’s military said it was examining plans for attacking Guam. Mr Trump retweeted news coverage about his heated rhetoric on Wednesday. Australia has no obligation to join military action if growing tensions between the US and North Korea escalate into war, Julie Bishop says. The Foreign Affairs Minister said today there was no “automatic trigger” for Australia to back the US in the case of war with North Korea. “We were not a party in the legal sense to the armistice so there is no automatic trigger for Australia to be involved,” she told ABC radio. Australia had been in constant discussions with the US however, including meetings between US Secretary of State Rex Tillerson and Ms Bishop in the Philippines on Monday. 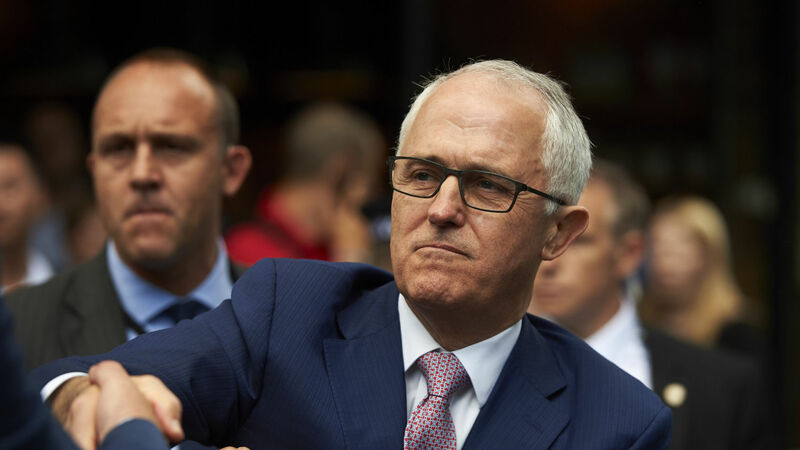 Prime Minister Malcolm Turnbull refused to outline Australia’s preparations in the event of conflict with North Korea today but said the government was “alert” to the unfolding situation. Australia’s plans were constantly under review, he told reporters in Canberra. “We obviously plan for all contingencies ... but I’m not going to get into speculative territory,” he said. Earlier today, the Foreign Affairs Minister defended Donald Trump’ latest warning that North Korea would be met be “fire and fury”. Ms Bishop said all responsibility for the escalation of tensions on the Korean Peninsula “lie at the feet of Pyongyang”. “I think that Secretary of State Rex Tillerson summed it up when he landed in Guam,” Ms Bishop told the Nine Network today. But she said Australia was not changing its strategy on the rogue state. Mr Trump’s evangelical adviser. Texas megachurch pastor Robert Jeffress, says God is on the side of the US President. “When it comes to how we should deal with evil doers, the Bible, in the book of Romans, is very clear: God has endowed rulers full power to use whatever means necessary - including war - to stop evil. In the case of North Korea, God has given Trump authority to take out Kim Jong-Un,” Mr Jeffress said in a statement, the New York Post reported. I’m heartened to see that our president ?- contrary to what we’ve seen with past administrations who have taken, at best, a sheepish stance toward dictators and oppressors ?- will not tolerate any threat against the American people,” the statement said. “But if you do wrong, be afraid, for rulers do not bear the sword for no reason. They are God’s servants, agents of wrath to bring punishment on the wrongdoer. Therefore, it is necessary to submit to the authorities, not only because of possible punishment but also as a matter of conscience,” the Bible passage says. Mr Jeffress, who once said former US President Barack Obama was laying the groundwork for the Antichrist, praised Mr Trump in January for winning the election and said the “demonisation” of Christians during the Obama administration was coming to an end.